MPC 1/48 Space Eagle Transporter Model Kit w/ Accessory Pack + Small Metal Parts. MKA014 + MKA016 + MPC825. Brand New in Factory Packaging. In Stock Ships Within 24hrs. 3 in 1 Combo Pack Included. 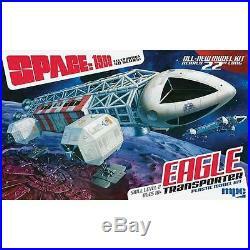 1X MPC 1/48 Space 1999 Eagle Transporter Kit. 1X AMT 1/48 Eagle Small Metal Parts pack. 1X AMT 1/48 Eagle Deluxe Accessory pack. 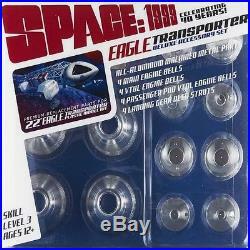 This is the 1/48 Scale Space: 1999 Eagle Transporter. Plastic Model Kit with AMT 1/48 Eagle Deluxe Accessory Pack. Highly detailed plastic pieces molded in off white, gray and clear. From the TV hit: Space 1999. Cockpit wall detail and pilot figure. Decorate 1 of 3 ways. One 1/48 Deluxe Accessory Pack MKA014/06. Length: approx 22 (558.8mm). AMT 1/48 Eagle Deluxe Accessory Pack. This is the 1/48 Scale Deluxe Accessory Set from AMT. Suitable for Ages 12 & Older. 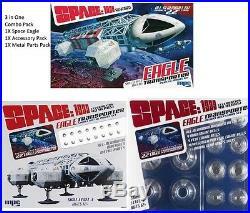 Accessories for the Space: 1999 Eagle Transporter kit (MPCS0825). 4 passenger Pod VTOL engine bells. 4 landing gear OLEO struts. 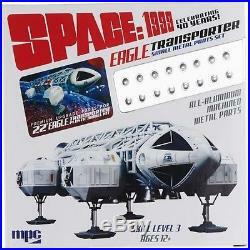 Space: 1999 Eagle Transporter kit (MPCS0825). Please note: I will not put less amount on custom papers, so please don't ask. You can return any item in Brand New/unopened condition (within 14 days). Please request for an invoice. The item "MPC 1/48 Space Eagle Transporter Model Kit with Accessory Pack + Small Metal Parts" is in sale since Saturday, March 12, 2016. This item is in the category "Toys & Hobbies\Models & Kits\Spacecraft". The seller is "power_hobby" and is located in Mahwah, New Jersey. This item can be shipped to United States, to all countries in Europe, to Canada, to Japan, to Australia.